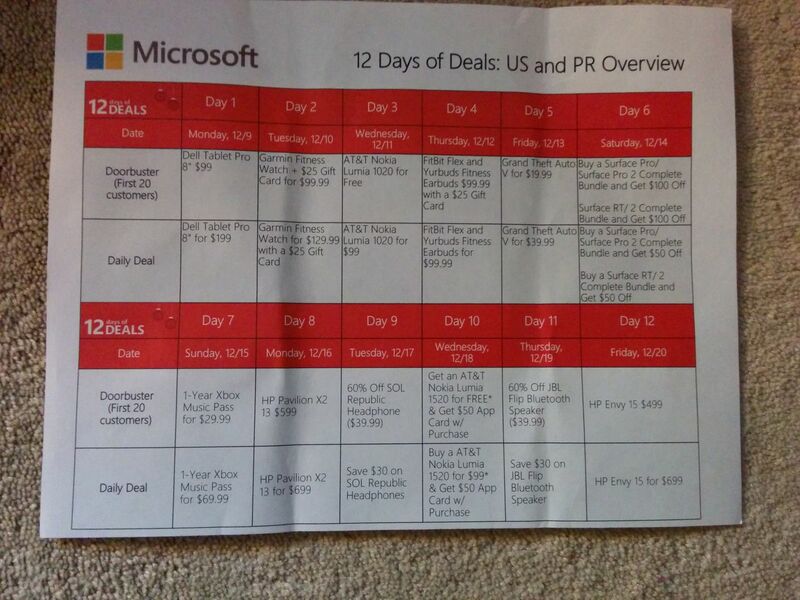 With Black Friday and Cyber Monday behind us, Microsoft(s msft) is allegedly looking to keep the retail momentum going with its 12 Days of Deals promotion. And a leaked document posted on the forums of Slickdeals purportedly details what you might be able to expect to go on sale from now until December 20. As you can see, the “doorbuster” deals look particularly good. But according to the calendar, they’re limited to the first 20 customers. Everyone after that will still receive a discount on that day’s chosen product – it just won’t be as steep. The HP Envy 15, for instance, which regularly costs $899.99, is said to go on sale for $499 for the first 20 customers on December 20. After that it’ll cost $699. There’s no way to know whether this calendar is authentic, but the Dell Tablet Pro listed here did go on sale for $99 today, lending the list a bit of legitimacy. Not $499, but better than the $699 non-doorbuster price. Though I’m curious what kind of Envy 15 the Microsoft Store is carrying (i7? i5? RAM?). Would be funny if it turns out to be the AMD Envy 15, heh. (My guess its the Core i7, 6GB with 1TB HDD config). You stole this story from TNW. Shame on you. Hey there. I actually got clued into this on Twitter, but this story has been reported on by a number of different outlets. Tried to take advantage of Dell deal and ended up quitting in frustration !! What a waste of time, Website crashed repeatedly. Think this will be the case for any one of those popular deals (GTA V especially).